It's been so great getting back to a healthier, fitter me. Since I really upted my game I'm really noticing a huge difference in my pain relief and physical capabilities. I'm walking further every day, lasting longer in my routine and noticing a massive difference in my muscle strength and stamina. The one area that's taking a long time to really improve is in my core stability and activating dormant muscles. 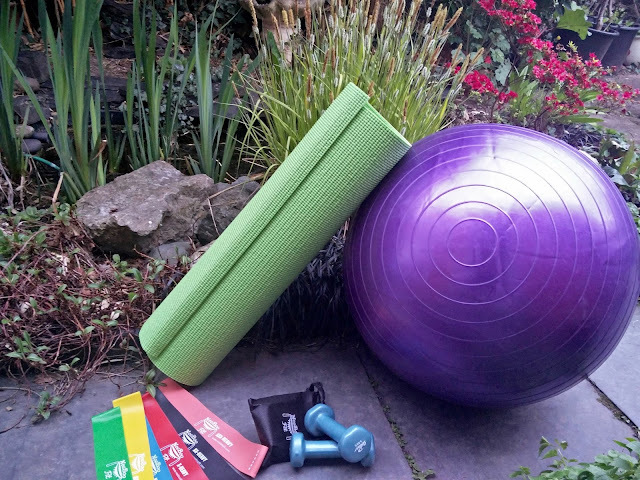 With that in mind I've got some new exercises to add to my fitness routine, so I thought I'd share them and let you know how I've been getting on. Most of my routine has stayed the same so if you'd like to know what exercise I do everyday you can find that by reading my first Fitness Diaries here. Once your done come on back and you can see what's new in the routine. Since I've started to really push myself my appetite has been increasing, so making sure i'm fuelling all my growing muscles is really important. I'm not one to completely hideaway from snack foods as I've always been an everything in moderation sort of girl, but I've definitely been making a conscious effort to increase my intake of protein, vitamins B, C & D, and Iron. I've also been cutting out caffeine although I'm not a regular coffee drinker, I've a weakness for tea! So i've cut it down to just two a day and will often opt for a green tea (which happens to be my favourite anyway! ), or a decaffeinated at least once a day. On a slightly similar vein I've also swapped dairy milk for almond or coconut milk to try and reduce how much dairy I consume. On the whole I'm doing really well with it I actually love alternative milks to that's a major bonus, but I really miss dairy I won't lie! I've also been slacking a little on my water intake so I'm making sure I always carry around my 2L bottle so there's no risk of forgetting now. So onto the real stuff. The last time I saw my Physiotherapist I was really surprised by how little balance I have. Although my muscles are really responding and getting strong by the day, when she asked me to sit on a balance ball and lift my un-operated leg, I fell over! haha I couldn't believe considering how far I thought I'd come that something so simple would have me sprawled on the floor. After a good laugh I got back up and we tried again. It was pretty apparent that my core is really needing some work so that simple exercise is now a major part of my routine. Sitting on the exercise ball I have at home, I practice lifting and replacing my feet one after the other for as long as I can without getting bored. I'm also practicing lifting my leg and holding it at 90 degrees and then raising my opposite arm and holding for 5 seconds before repeating on the other leg. I'll tell you, it sounds simple but it's really hard! Still it's got to be done, and as a clever way to make sure I really work my core I've done as many people do and replaced my computer chair with the exercise ball. Any time I have to sit down - work/tv/food, out comes the ball and at a minimum I'm always engaging my core but whenever I can I add in my exercises. Hopefully before long I'll be back on top of this too and both sides will be equal. So although increasing strength has been a part of my routine for some time now some of my muscles are still pretty stubborn - mainly my inner thighs and glutes. 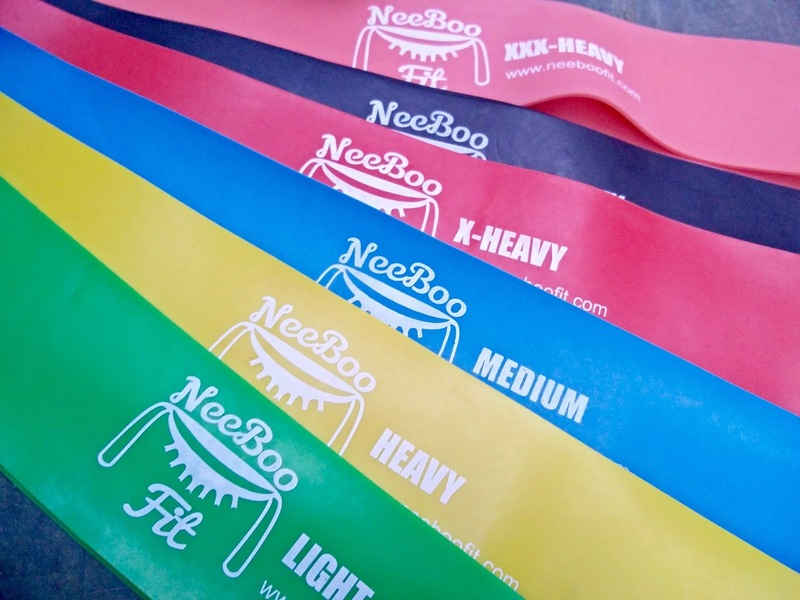 These resistance bands have been amazing in finally getting those muscles to activate. One of the major changes to my previous routine is upping my squat game. We've finally moved away from the wall to make my glutes work harder, but we've also added in a leg squeeze so the thighs and glutes are all working together. You could use a small exercise ball for this but as I don't have one I'm a big believer in repurposing things around the house so depending on what's handy I now either place a chunky towel or my rolled up yoga mat between my knees so as I squat with my hips rotated back, I really have to squeeze to stop it from falling and I can finally feel my glutes actually responding! To then work the inside of my thighs I use the resistance bands, so it almost works in the opposite way. Squatting as usual but then focusing on keeping the band taught and at the same stretch without stretching too far or letting it go loose. I can tell it's making a difference too because I'm experiencing a lot less pain when I sit down so that get a massive thumbs up from me. I'm using the resistance bands to focus on my thighs but especially my inner thighs to get them working. I love that these bands are circular so all I have to do for this second exercise is step through, place the bands around my ankles, or below my knees, and do a size stepping action to create some resistance. Very handy when I'm waiting for the kettle to boil for that tea I'm not meant to be drinking! I happened to have these long before surgery but I love them. They're such good quality and they are again eco-friendly like my yoga mat so they tick all my boxes. It's great that the set has so many different strengths too because I'm right down at the bottom using the green and blue ones right now so I know there's plenty more to keep pushing me as I get stronger. If you're interested I'll leave a link to those too. 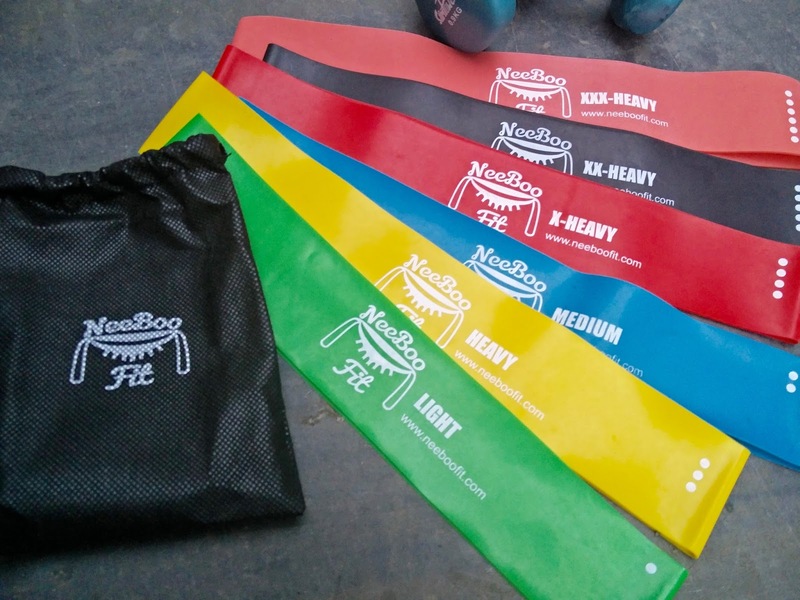 I just picked them up on Amazon a while back and they come with a ton of exercises if you're looking to get fit without joining the gym, there's loads of things you can do to strengthen all of your body. 10 heel stretches lowering from a step,10 second lying knee hugs, and a further 10 seconds with my operated leg stretched over the side of a bed/table. I think this may be the thing that takes the longest to improve because my hip socket it really tight now but I'm remaining positive. Overall i'm seeing so much progress it's really boosted my optimism and my motivation to keep going. You never know I might be running marathons next year! 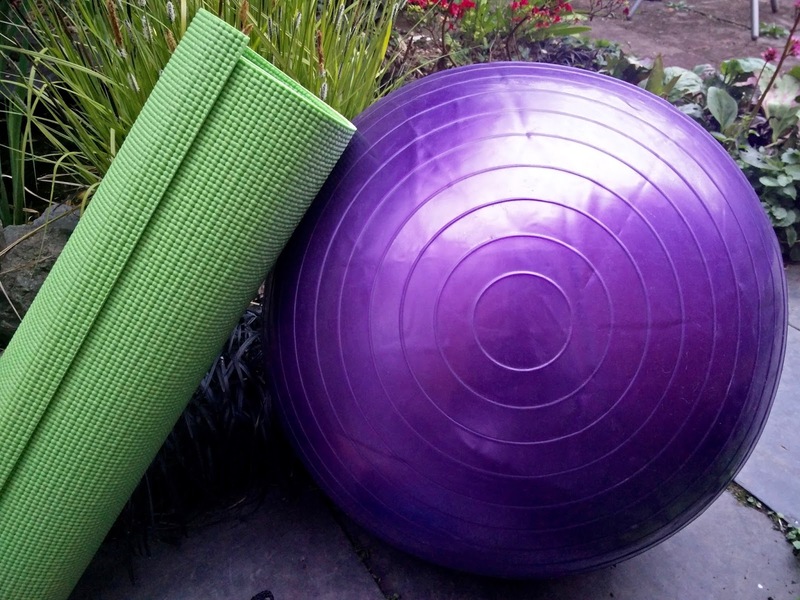 So tell me, is there any equipment like my exercise ball, yoga mat or resistance bands that you can't live without? Or is there anything you're really wanting to try out? Let me know in the comments and I'll speak to you soon! Bikini season definitely makes me work harder too! Well done though. Don't you think one always comes after the other? You work out, you feel good so you want to work out more, so you feel awesome...! Sounds like you're doing really well! I love seeing the progress when I really stick with my routine, so must be doubly inspiring when it's helping your recovery. Hope it continues!